Atlanta (Nov. 13, 2017). Shark and ray experts from around the world gathered at Georgia Aquarium last week to evaluate and intensify international initiatives to save some the world’s most threatened aquatic animals: the sawfishes. Participants of the workshop, convened by the Shark Specialist Group (SSG) of the International Union for Conservation of Nature (IUCN), are building upon a 2014 Global Sawfish Conservation Strategy to develop model, regional programs for reversing severe, worldwide declines in sawfish populations. Sawfish -- warm water, shark-like rays characterized by long, toothed snouts (“rostra”) -- are large rays that can reach over seven meters in length. Once found in the coastal waters and rivers of more than 90 tropical and subtropical countries, all five species are today classified as Endangered or Critically Endangered on the IUCN Red List. Targeted and incidental fishing is the main threat to sawfish. Their rostra – which they use to detect and wound prey are easily entangled in many types of fishing gear. The loss of critical nearshore habitats, particularly mangroves, also poses a threat to sawfish survival, as does strong demand for their fins, for use in shark fin soup. 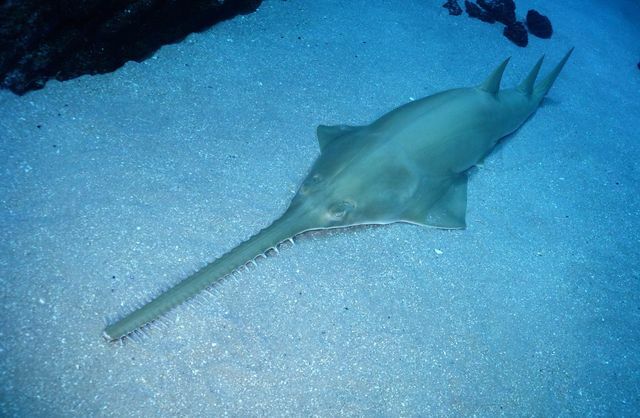 Sawfish, like other rays and sharks, are especially susceptible to overfishing because they tend to grow slowly, mature late, and produce few young. Sawfishes are listed on the Convention on International Trade in Endangered Species Appendix I, which essentially amounts to a ban on commercial international trade. Since launching the Strategy in 2014, the SSG has welcomed sawfish listings under the Convention on Migratory Species, attention through various regional treaties, and national protections in countries such as Pakistan, Bangladesh, and Costa Rica. IUCN SSG leaders plan to present the key results of this week’s meetings, including recommendations for priority activities, next summer at the Sharks International Meeting in Brazil and the United Nations Food and Agriculture Organization Committee on Fisheries meeting in Rome.